About a week ago I had a blog post with trees and leaves at its heart. Today a tree is mentioned but from a completely different angle and purpose. From time to time I have brought to your attention a piece of sculpture from my travels and each one has been well received. Now I have another one. I had reason to visit Antrim Area Hospital, not for the first time, but the other day I was well prepared, the visit was short and I had brought my camera. 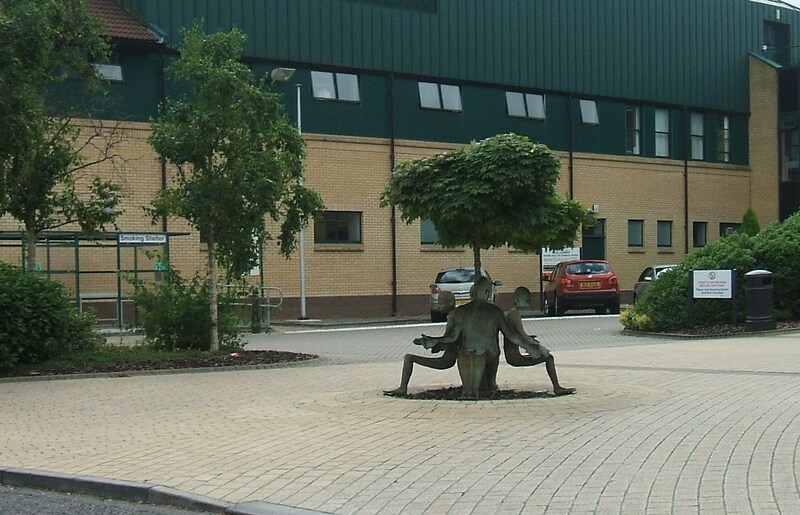 The Healing Tree is a bronze cast sculpture, by Brian Connolly who hails from Ballymoney, Co. Antrim, in Northern Ireland. It is sited in the Forecourt and owned by Antrim Area Hospital. The theme is ‘mutual support’ and the hollowed-out figures of two men and two women are in a sitting position, about 1.2 metres high. They are positioned in a circle, facing outwards, with each supporting the other. The rear surface of each figure is textured with elements of bandages and embedded leaves. 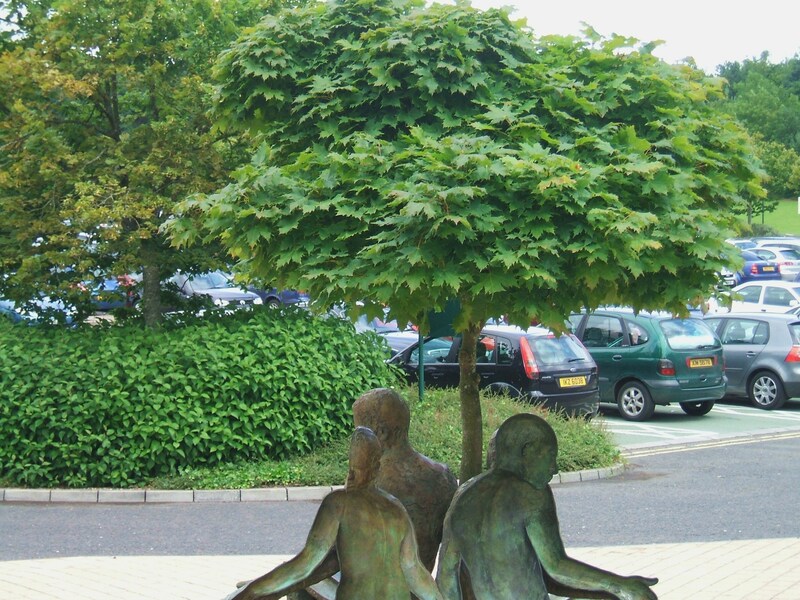 The tree in the centre is an ornamental Norwegian Maple and it is “symbolic of life around which we are placed”. Unfortunately there was a car on my tail as I was leaving the car park, so I was unable to stop and photograph The Swans another sculpture on a bank at the side of the roadway. 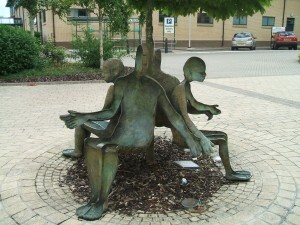 This entry was posted in Ireland, Photography, Sculpture on July 18, 2009 by Grannymar. Art at its very best. The creativity is obvious. Thank you for sharing this. One thing struck me immediately – can you actually sit on the figures or are they strictly sculptures? A wonderful bit of art at any rate. @Ashok – I am glad you enjoyed it. @Nick – A person would need to be very thin to fit, and it would be very uncomfortable I imagine. I thought it missing something, GM and it occurred to me there should be some seating around it for the more mobile patients, so they could spend some time with it. It is beautiful. There are a few bench seats about, but they are far enough away to give the full view and yet not in the way of those coming and going through the main entrance. I love that!! Do people ever sit in the laps of the statue people? @Ramana – It is unusual. @Brighid – I find art gives me a different perspective. @Judy – I think it might be difficult to sit into the hollowed out shapes. That would look super in my garden. What do you s’pose they’d take for it? All kidding aside, art that makes you think about it and remember it has already accomplished. Who cares about utility. It would look well in any garden and the hollowed laps a natural birdbath to draw the birds. Alice I know you commented a long time ago, but your instinct is very close to the reality of the artwork’s development! The original idea was for a private garden and I had proposed to cast the family around a tree. The idea was too radical for the father and I did not get the commission at that time!…. but it did lead to this artwork for the Antrim Area Hospital! Brian. I am honoured that you have taken the time to visit & comment on my blog. I love to hear the back story of how a sculpture comes to be, that might be the craft woman in me. It has been a long time since I published this piece, so I will let Alice know that you replied to her comment. I love sculpture and carry a camera with me everywhere I go, not wanting to miss capturing some delight to share here on my blog. I recently stayed at Antrim Hospital. 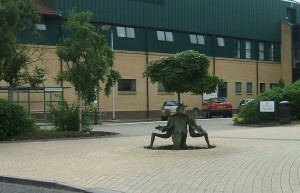 The Healing Tree is not being looked after by the hospital management. The drain holes in the laps and feet are blocked. They are full of rain water and debris including cigarette butts. Shamefull. Ron, sorry to hear that.